N-monomethyl phosphatidylethanolamine (MMPE) and N,N-dimethyl phosphatidylethanolamine (DMPE) species are intermediates of phosphatidylcholine (PC) de-novo biosynthesis through methylation of phosphatidylethanolamine (PE). This synthesis pathway for PC is especially important in the liver when choline is deficient in the diet. Despite some efforts focused on the analysis of MMPE and DMPE species, a cost-effective and high-throughput method for determination of individual MMPE and DMPE species, including their regioisomeric structures, is still missing. Therefore we adopted and improved the “mass-tag” strategy for determining these PE-like species by methylating PE, MMPE, and DMPE molecules with deuterated methyl iodide to generate PC molecules with nine, six, and three deuterium atoms, respectively. On the basis of the principles of multidimensional mass-spectrometry-based shotgun lipidomics we could directly identify and quantify these methylated PE species, including their fatty-acyl chains and regiospecific positions. The method provided remarkable sensitivity, with a limit of detection at 0.5 fmol μL−1, high specificity, and a broad linear-dynamics range of >2500 folds. 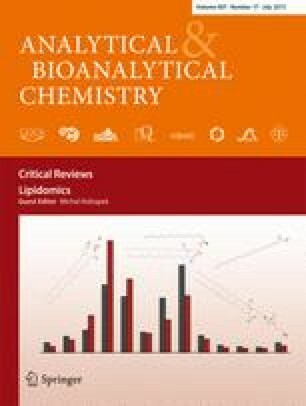 By applying this method to liver samples from streptozotocin (STZ)-induced diabetic mice and controls, we found that the levels of PC species tended to decrease and the amounts of PE species tended to increase in the liver of STZ-induced diabetic mice compared with controls, but no significant changes in MMPE and DMPE species were determined. However, remodeling of fatty-acyl chains in the determined lipids was observed in the liver of STZ-induced diabetic mice, with reduction in 16:1 and increases in 18:2, 18:1, and 18:0 acyl chains. These results indicated the improved method to be a powerful tool to reveal the function of the PC de-novo biosynthesis pathway through methylation of PE species in biological systems. The online version of this article (doi: 10.1007/s00216-015-8534-4) contains supplementary material, which is available to authorized users. This work was partly supported by the National Institute of General Medical Sciences Grant R01 GM105724 and Intramural institutional research funds.